Adrian Lam admits he was happier with the zero points leaked - rather than the 42 scored - after Wigan's one-sided victory against Catalans. The sparkling performance was made all the more impressive given four young forwards figured in a depleted pack. But they stepped up to the mark, helping Lam's side to a second successive win which moved them to within two points of fourth-position - and put a full-stop on premature talk of an early-season crisis at the club. Joe Burgess led the rout with a hat-trick while Zak Hardaker and Jarrod Sammut - both impressive - scored their first tries for the club. Lam said: "I could feel it coming, even at half-time I felt like we had four or five chances we didn't take, but considering the players we had out it was a good win. "I still think we'll get better. In certain situations we didn't do what we spoke about - but the great thing is what we've been through, the leadership group said, 'We're sticking with it, win or lose. If it's this week, or four weeks, we're sticking with it', and it paid off. "I know everyone will talk about the 42 but I'm more happy with the no points against. "We know we've still got a lot of hard work ahead of us - but it's good to be in a winning dressing room, it's a completely different vibe." 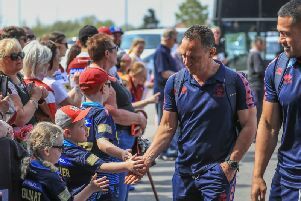 He was particularly pleased for young forwards Liam Byrne, Liam Paisley, Oliver Partington and 18-year-old Morgan Smithies, who collectively had 15 appearances between them. "Liam Byrne played 60 minutes straight in the front-row, as a 20-year-old," said Lam, who also described seeing Smithies stand-up to veteran Greg Bird as "one of the highlights of the game." "I saw Morgan play against the Australian Schoolboys last year and he was great, so I was looking forward to giving him an opportunity. He has a big future at the club. "And Joe Shorrocks was 18th man, too, so if anyone else had pulled out he'd have played. It's a great sign we're prepared to give the young ones a go."